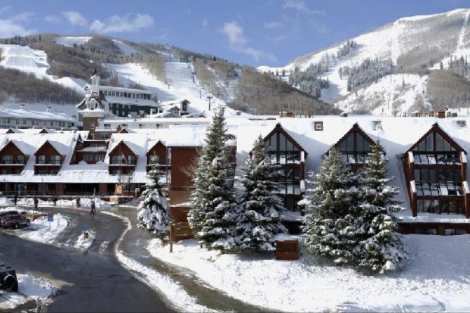 The Lodge at Mountain Village offers great slope-side condominiums with the best ski-in ski-out access at the base of Park City Mountain Resort. Located just above the ice rink, this condo has beautiful resort views. Three bedrooms offer room to sleep eight guests in this ski-in / ski-out spacious condominium located in the main resort village of Park City Mountain Resort. The perfect location for your ski holiday, enjoy access to four chairlifts and slope-side convenience right outside your door. The mountain village hosts dining, shopping and a festive après scene for those looking to continue the fun after the ski day is over. The village ice rink is located just outside the condo for family fun, or head over to the indoor/outdoor pool, hot tub, sauna and fitness center and relish time to unwind and rest ski weary muscles. This condominium offers mountain contemporary décor, a nicely appointed kitchen, gas fireplace and flat screen TV’s throughout. A perfect mountainside retreat, you’ll enjoy calling this home during your Park City vacation.